The Society and Association of Gardeners in the Shire of Midlothian was the first gardeners' style group in the city. However, although the membership included working gardeners its aims appear to have been commercial. They leased and let land at Dalry (near Romilly Place and Gardner's Crescent) as market gardens. The Society appears to have failed in the 1730s. It was succeeded by the Caledonian Gardeners' Lodge of Edinburgh also known as the Caledonian Gardeners' Friendly Society. This body was formed in 1782. Like its neighbours in Dunfermline and Haddington it admitted non-gardeners from the first although on different terms to working gardeners. Writing in 2000, Forbes Robertson in Early Scottish Gardeners and their Plants recognised that the 'traditional aspects of a craft guild' were not as important as the continuing 'need for mutual support in times of stress'. So the association was mainly for mutual aid. Great care was taken to admit only those who were already known to members, or who could provide certificates of age and health. In any event, there were upper limits of 40 years for admission (as Dunfermline) and 32 in the case of non-gardeners. 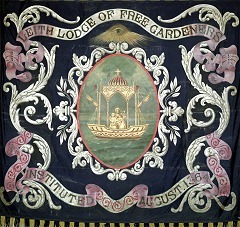 In 1849 the Ancient Order of Free Gardeners was formed with headquarters in Edinburgh. 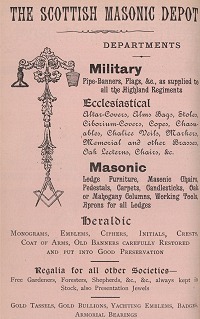 The Edinburgh and Leith Post Office Directories include a separate Friendly Societies Directory that can be used to follow the fortunes of the Order and the city based lodges. For a long time Grand Lodge shared premises with the Oddfellows in Forest Road. In the 1880s there were five Edinburgh and three Leith lodges affiliated: St Cuthbert's, Barony of Broughton, Athole, St Andrew's, St George's, Archibald Stewart, Leith and St Antony. The Ancient Order faced competition from the British Order of Free Gardeners based at the Free Gardeners' Institute at 10 Broughton Street and later 12 Picardy Place. 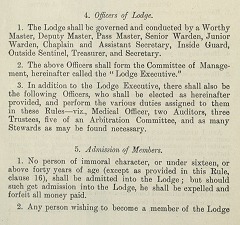 They eventually mustered 19 lodges in the city, joined later by associated juvenile and female only lodges. They began their push into the Edinburgh area around 1880. The Order's offices ceased to be listed after 1973. Also in Edinburgh was the Masonic Depot of AM Jockel and Company. Based in George Street, this firm supplied military, ecclesiastical and Masonic necessaries as well as 'Regalia for all other societies - Free Gardeners, Foresters, Shepherds, always kept in stock' according to an advertisement in 1900.